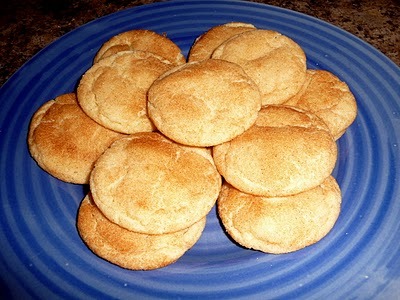 I Love snickerdoodles!! !They are the right balance of sweet and tart!I got this recipe from my Grandma’s cookbook. Here’s the recipeSNICKERDOODLESPreheat oven to 400 F Mix together well: 1/2 cup butter (softened)1/2 cup shortening1 1/2 cups sugar 2 eggsSift and add: 3 cups flour1 tsp baking soda2 tsp baking powder2 tsp cream of tartar1/4 tsp saltRoll into balls (walnut size)Roll in mixture:2 Tbsp Sugar2 Tbsp cinnamonBake on ungreased cookie sheet 8-10 minutes until lightly browned, but soft.I bake mine for 8 minutes and they turn out perfect!Enjoy! this is my favorite snicker doodle recipe!